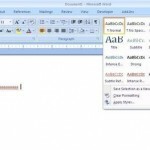 Do you want to create a MS Word Table in Word 2007? 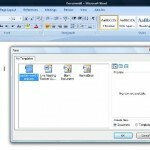 This article details the steps to Create Word tables in Microsoft Word 2007. How To create a Table in word 2007? Navigate to the Insert Ribbon by clicking on the “Insert” tab at the top. If you know how many rows and columns you need for your Word table, Click on the “Table” button in the “Insert” Ribbon and mouse over the table configuration of rows and columns that you wish to insert. 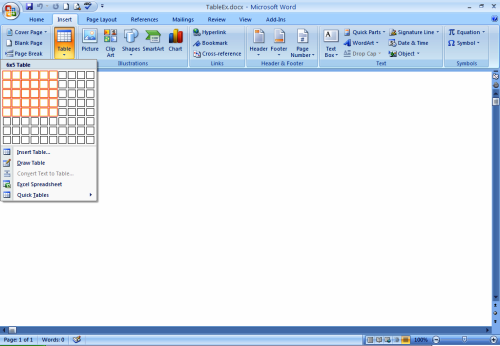 You can also create tables in MS word 2007 by choosing either the “Insert Table” or “Draw a table” option. Yet another method to create tables is by choosing “Excel Spreadsheet” from the listed options, and this will insert a spreadsheet object into your word document. Finally, you can also create Word tables by choosing one of the several built-in table templates, listed under the “Quick Tables” option. How to create MS Word Tables With specific column widths? Create a one-row, multi-column table, using the first method. This single row table shall fill the whole width of your document, from margin to margin. Use the mouse to adjust the width of the columns i.e. make them as wide as you may want it to be. Place the insertion point in the last column of the table. Select “Layout” under the tab labeled “Table Tools” and click on the “Split Cells” icon from within the group labeled “Merge”. In the resulting “Split Cells” dialog, specify the number of columns to split the chosen cell. How to delete a column in a Word table? Move your mouse pointer on top of the table column that you wish to delete, until you see a small arrow pointing downward, and click once. The entire column will be highlighted. Right-click on the highlighted column and select “Delete Columns” from the menu options. Similarly to delete a row in a table, choose the entire row, right click and click “Delete Rows” from the menu options. 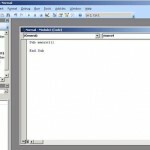 That is all about creating a Word Table in Microsoft Word 2007!